Whenever you hear that a close friend of a celebrity has commented on news, you should be skeptical. Since defining a close friend is legally impossible, tabloids tend to take advantage of the “friend,” who is more frequently someone who passed them on the sidewalk or used the same bathroom. The internet has been buzzing about a new cougar relationship for international pop star Taylor Swift. Rumor says she’s dating One Direction hottie Harry Styles. For the 1D fans out there, take a deep breath. I’m sorry to say, but we have confirmation! 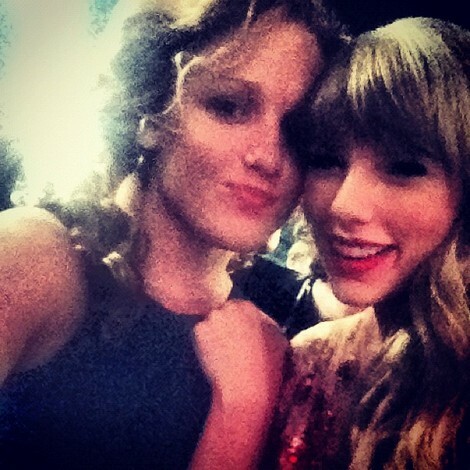 Taylor has always been really open about her relationship with Abigail Anderson, whom she met on the first day of high school. In fact, Abigail inspired the hit song Fifteen, and she’s appeared in several of Taylor’s music videos. Considering the volume of Swifties that try to use Abigail and her twitter to get to Taylor, we’re pretty shocked she let this slip! You can check out a few pictures from the CMAs here, as well as a screenshot that shows Abigail using Instagram to show support of her BFF’s new man. We’re sure Taylor will be pretty disappointed that Abigail let something like this slip. Taylor is notoriously private about her relationships—until she turns them into songs and makes millions off the profits! What will she have to write about Harry? Hopefully she’ll mention his weird bird chest tattoos and voluminous hair! Do you think it’s strange that Taylor is obsessed with younger men? Could a duet be in the works? Let us know what you think about this confirmation! Did Conor Kennedy Cheat On Taylor Swift?